Sunbathe in the warmth of Florida´s sunshine in your own private pool ( heated ). Relax in the fully screened lanai with outdoor table and chairs and enjoy a beautiful view on the golf course. A beautiful landscape provides a lot of privacy around the pooldeck. Three bedrooms, two bathrooms - Completely renovated in 2018. New interior painting and refurbished kitchen and bathroom cabinetry. 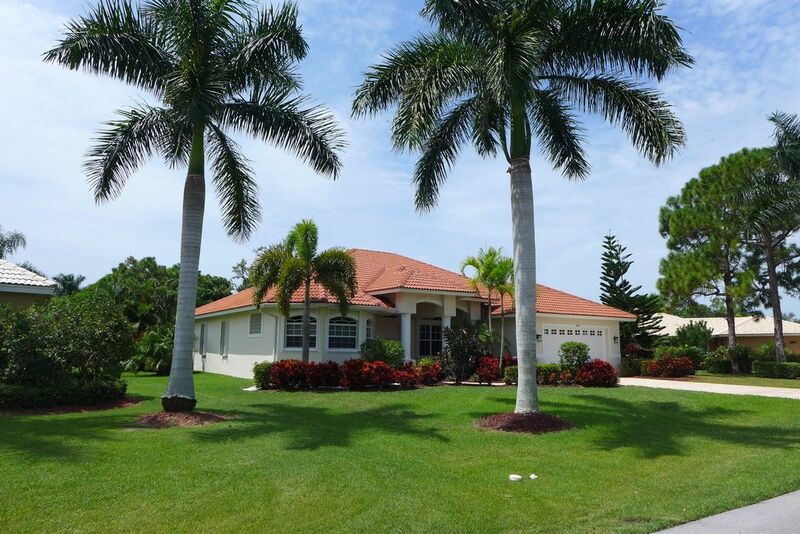 This exclusive and tastefully furnished single family villa home will please you! The contemporary furnishings with expensive Italian Design pieces are enriched with tropical accessories. So all in all you will find a fashionable stylish interior. With two car attached garage and an own golf-cart. High ceilings, flat screen TV in living room ( HD ) and bedroom, high speed Wi-Fi internet. Updated kitchen with granite countertops and stainless steel appliances. Fully equipped with linen, towels, kitchen utensils, even iron and ironing board. The beaches are nearby (public access of Bonita Beach is about 3 miles distance). Many cozy restaurants and good supermarkets (Publix, Whole Food, Trader's Joe, Wal- Mart, Fresh Market) are reachable in maximum 3-12 minutes. CVS and Walgreens are just around the corner. Exclusive shopping malls ( Coconut Point, Gulf Coast Town Center, Mercato, Coastland & Edison Mall) are waiting for you. Miromar Outlet Mall is only 1 exit on I 75 away. We also provide beachchairs, beachtowels and bikes. Golf-Community near to 41, Social Life and Beaches. Near to Ft. Myers Airport. Big lot, lanai and pool facing south west, lots of privacy, attractive floor plan. Rentals at Bonita Beach Rd. Boat Rental at Bonita Beach Rd. We rented this home in April 2011. It is one of the nicest properties that we've ever rented. The owners obviously love their home! The home is clean, with plenty of towels and decent linens. The kitchen is well-equipped and the layout was perfect. The heated pool was spotless, nice golf course view, good shopping and restauarnts within a short drive. We really enjoyed Spanish Wells - it is a very friendly development. Would definitely rent from this owner again. Rates upon request and vary during year. Longterm renters are welcome to ask for discount.